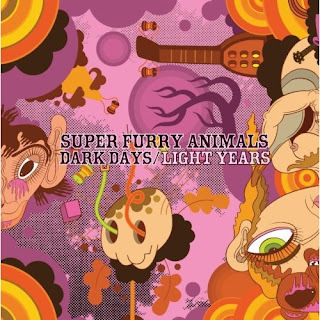 Ronald Says - memoirs of a music addict: Super Furry Animals Light Years Ahead? With this band you never know what you're going to get. Next to masterpieces like "Rings Around The World" are albums that just don't do it for me. Let's see where this album fits in. The new album of the Welsh band Super Furry Animals starts off pretty interesting. Nice funky sound and falsetto vocals blend into some 70s style rock jam. Accompanied by typical SFA lyrics the opening is promising. However then the tracks turn into more experimental tunes that don't seem to go anywhere. They find their climax in "Inaugural Trams" that's stuffed with electronic effects. Then halfway the album things change around and it all becomes more coherent. Especially tracks like "Helium Hearts", "White Socks / Flip Flops" and "Where Do You Wanna Go" are typical SFA pop tunes although these sound all very alike. This makes the album not balanced enough. They do find the right balance in the last track "Pric" which is a great 10 minute psychedelic journey. Although not a masterpiece it still is a nice album. But it may stay in your cabinet after a few listens.